A critical reflection by Maria Rose Sledmere on A+E’s debut publication and launch event, But There is No Land Near the End. Describing a time period in which the actions of humankind enter geologic history, the Anthropocene is not just a scientific framework, but rather, as Heather Davis and Etienne Turpin argue, ‘a social imaginary’, whose speculative parameters encompass many discourses, including those of ethics, aesthetics and affects. What is missing in much climate change discourse is a discussion of the emotional consequences of its effects and threats, played out at levels both individual and interspecies, everyday and planetary. Coming to terms with eco-anxiety, chronic stress, grief and environmental despair necessitates the fostering of cross-disciplinary knowledge exchange, certainly, but also a creative re-visioning of our world as it is, was and might be in future. As the term ‘nature’ shifts from something ‘outside’ to a deep sense of ourselves as thoroughly enmeshed in ecological feedback loops, it becomes increasingly important to register the metaphysical wilderness of humankind itself: to negotiate individual vulnerability and responsibility within the destructive consequences of our actions as a species. To realise, furthermore, the mutually productive capacities of art and science at thinking through the complexities of environmental phenomena whose scales vastly transcend our daily lives. Founded by students and graduates of the Glasgow School of Art, A+E Collective was formed in 2017 as a response to a shared sense of unease in the face of impending ecological disaster. Thoughts of a fraught tomorrow, a polluted world or a world underwater, can be isolating, and the purpose of A+E is to offer a forum in which people can tease out the entanglements of climate crisis, as they see, feel or fear it. Working from a shared commitment to art as a tool for communication and force for change, A+E’s aim is to question neoliberal, anthropocentric rationale and to produce alternative forms of action within the spheres of art, academia and public discourse–to look beyond existing representations of climate change in the media and forge a more productive, playful and probing account of everyday life and cultural experience within the Anthropocene. With designers Finn Arschavir and Ane Lopez and curator Jessica Piette at the helm, A+E members now also include GSA graduates Lucy Watkins (BA Communication Design), students Inès Gradot, Marie Leguedoise (MDes Communication Design) and University of Glasgow graduate Maria Sledmere (MLitt Modernities). Inspired by the collaborative, plural practices of artists and philosophers like Olafur Eliasson, Agnes Denes, Donna Haraway, Michael Marder and dark ecologist Timothy Morton, A+E is strongly committed to developing cross-disciplinary and institutional support networks for work towards ecological art practice. This builds upon our team’s previous experience with sustainable art practice, environmental writing and arranging funded events around, for example, landmark ecological films and texts. The Collective’s first publication, But There is No Land Near the End, comprises a selection of visual art, photography, literature and commentary assembled from responses to an open call for submissions in 2017. With support from Creative Scotland, A+E launched the publication at The Art School in March 2018. The event’s aim was not simply to present a selection of works from the publication, but rather to foster a durational experience in which audience members could ‘re-tune’ their perspectives on landscape, recycling, materiality, consumerism, the weather, the lives of different species and other themes pertaining to climate change. The evening was thus presented as a continuous rolling through different aesthetic forms, intending to allow ecological themes to reflect and refract naturally, as it were, between the pieces–in turn revealing how different forms of creative practice can collaboratively help recalibrate our sense of Anthropocene reality. Steering away from didactic or fear-mongering presentation, the event was designed as a positive trigger for encouraging discussion between creative practitioners around the topics raised by each piece. A+E aims to provide a social, discursive and collaborative nexus for environmentally-inclined minds, as well as showcasing works which translate the abstractions of much ecological theory into accessible and stimulating visual, sonic and literary forms. Since its very title begins with a contrasting conjunction, But There is No Land Near the End invites a sense of rupture within established thought. Its overriding theme is ‘disconnection’, and the publication’s layout depicts the gradual swallowing of land by water, as white space is consumed by sprawling spreads of text and photography. Printed on recycled tabloid newspaper, the production and circulation aspires to locality and sustainability, while resonating with the globalised prospect of newsprint as mass media object. Equally, we sought contributors based in Glasgow but mostly also overseas. By using a traditional discourse of information dissemination, we hope to broadcast alternative, experimental and collective perspectives on a narrative that surpasses everyday comprehension. Straying from the hyper-gloss or saturated colour of other printing methods, newsprint embeds its subjects with a sense of lost presence; if news is the medium of immediacy, then A+E’s use of it channels the ecological unease of the present-tense: striving for speculative, sustainable aesthetics in a way that also seems always-already archival, a record of environmental experience for posterity to-come. This echoes the practice of several artists within the publication: from Bärbel Praun’s Impermanent Sculptures (of Indestructible Objects) to Bastian Birk Thuessen’s Physical evidence of abstract events , there’s a continual emphasis on rendering the ephemeral promise of objects within more substantial climatic dramas. The title of the event and publication is sampled from Richard Carter’s groundbreaking series of drone poems, Waveform (2017), which investigate the intra-active potentialities of digital sensing, inscription and material semiotics within the Anthropocene. A similar aspiration towards multimedial platforms was evident at the publication’s launch, where cinematic pieces transitioned into poetic performance, and the fractal unfoldings of live cello playing gave way to ambient audio-visual scenery. Opening the event, screened on a loop, was Marc Johanson’s animated film, Life More Abundant ‘98 (2017). One recurrent theme of the evening was solastalgia : Glenn Albrecht’s term which evokes the homesick feeling of losing one’s home without leaving it; the sense of the land you knew as a child altering irrevocably around you. With collaged landscapes and glitchy shifts between scenes of memory, Johanson captures the plural ontologies of this feeling, played across sublime worlds that blur the real and virtual. Johanson’s piece transitioned into Sarah McWhinney’s performance: a kind of intersemiotic translation of scales, which combined slowly pulsating microbial imagery with ambient scratches and cello glissando. Following McWhinney’s performance was a screening of German-based Sissel Thastum’s film No you without Mountains, without Sun, without Sky (2017) . Just as McWhinney’s sound-art necessitated a slowing down of consciousness, Thastum’s piece provoked an immersive experience of the pared landscapes, foliage and waters it depicts. With the screen darkening and the room’s space enclosing, the next work was a spoken performance by myself, accompanied by a soundscape composed by Greece-born producer, Vasilis Al. Titled Litanies for Eco-Dissonance , the piece unravelled literary responses to an Anthropocenic bewildering of scales, species and feedback loops of cause and effect, disaster and longing. Following Litanies , we screened an eclectic film by Finnish artists MSL & Jaakko Pallasvuo, titled Bridge Over Troubled Water (2016) . Its narrative riffs on the idea of Simon & Garfunkel travelling through time to navigate emotional responses to climate change. Blending a pastiche of moods and styles, it evoked a familiar twenty-first century ontological condition: that of existential disconnection, of being split across multiple times, affects and strands of causality. At once playfully ironic and movingly sincere, the film elicited the liveliest reaction from the audience and showed how humour might assist aesthetics in artistic negotiations of Anthropocene themes. Its sublime conclusion in the most northwestern point of Finland, with the protagonists struggling onwards through a snowy tundra, indicates a distinctly metamodern approach to grappling with life in the Anthropocene: a structure of feeling that strives towards utopian thought in spite of an awareness of hypocrisy and failure; a swinging between apathy and enthusiasm. The film’s ending was an apt way to draw close to an evening of works whose own affective structures represent nothing if not the entanglement of various emotions, epistemologies, desires, perspectives and ethical impulses–resulting, ultimately, in an atmosphere of both caution, hope and creative potential. Interpersonal and cross-institutional support is built into A+E’s framework. In addition to the bulk of funds coming generously from Creative Scotland, we raised over £1000 from donations via Kickstarter; such a bottom-up approach to financial backing enables creative freedom but also initiates personal relationships with individual backers. Supported by a playful but arresting promotional video, A+E operated the Kickstarter as a kind of ‘clinic’ for eco-anxiety, in which backers receive varying levels of ‘treatment’ according to their donation amount. This ranges from a personalised A+E prescription to Skype therapy and unique responses to individual symptoms of anxiety. Taking the metaphor of an eco-clinic to its more literal limits, such a method acknowledges that when we are harming the planet, we are also harming ourselves. Dealing with climate change, we believe, is most productive when the approach is positive, healing and mutually constructive; continual self-flagellation can only instate further denial and pain as a species. To move on, to prompt change and solution, to sort practical remedy amidst existential upheaval, we have to work through our emotions too. Maybe art is one of the best ways to do this. Maybe art, as Morton puts it, riffing on object-oriented ideas of aesthetic causality, is a ‘kind of magic’, that can tell us ‘something very deep about the structure of how things are’ and indeed might be in future. As Mari Keski-Korsu writes in her piece within the publication, ‘holding space with peat’, empathy for nonhuman entities–that ontological reach out of consciousness–‘requires a lot of imagination’. It’s A+E’s intention to tap into that aesthetic alchemy, to explore art’s ecological potential in a mode that is thoroughly affective, self-aware and speculative, ethically questioning and pleasure pursuing; seeking the potentials of many disciplines to weave threads of light through the murky complexities of the past, future and Anthropocene present. With But There is No Land Near the End, we hope to capture the anxieties and material complications of now, but feel that a print publication resists the easy slide into extinction characteristic of much contemporary discourse. 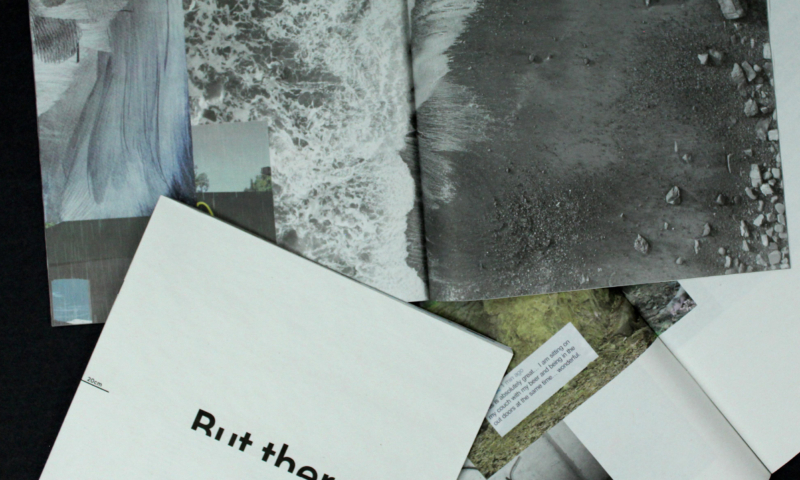 As both archive-to-come and presentation (in the sense of displaying information in its present moment), the publication is designed to stand the test of time: to invite a sense of dynamic longevity, in dialogue with the ongoing work of its contributors, as much as the changing cultural and physical landscapes around us. But There is No Land Near the End is available online and at selected bookstores, including Good Press, Aye Aye Books, Anti Liburudenda, Librería La Canibal. Politics,. Environments and Epistemologies (London: Open Humanities Press).